SIX exchanges, Switzerland’s largest stock exchange hit the new announcement of launching an exchange-traded product (ETP) based on XRP. Accordingly, this will enable the exchange to track the price of XRP, the third largest cryptocurrency which is currently trading at the value 0.31 against US dollar. The process will be similar to the price tracking of Bitcoin (BTC) and Ethereum (ETH) – the news was confirmed by Amun AG which is a Swiss crypto company. Reportedly, Amun AG is already managing a list of various cryptocurrencies on SIX exchanges and eventually received SIX’s approval to launch ETPs for other cryptocurrencies including Bitcoin Cash (BCH), Litecoin (LTC), Stellar (XLM) and EOS. According to Monday’s announcement, the XRP ETP will be traded under ticker AXRP just like ETH under the ticker symbol AETH and BTC under ABTC respectively. Excited to share what we’ve been up to @AmunAG: safe, easy, regulated ETPs to invest in an index of cryptos, Bitcoin, Ethereum, and (soon) Ripple. However, the very first ETP of SIX platforms was launched under the ticker name in HOLD in November 2019. As for now, the SIX is world’s first exchange debuting multi-crypto- based ETP under HODL ticker by Amun Crypto Basket ETP – consequently, the index will track prices for BTC, XRP, ETH, BCH, and LTC. 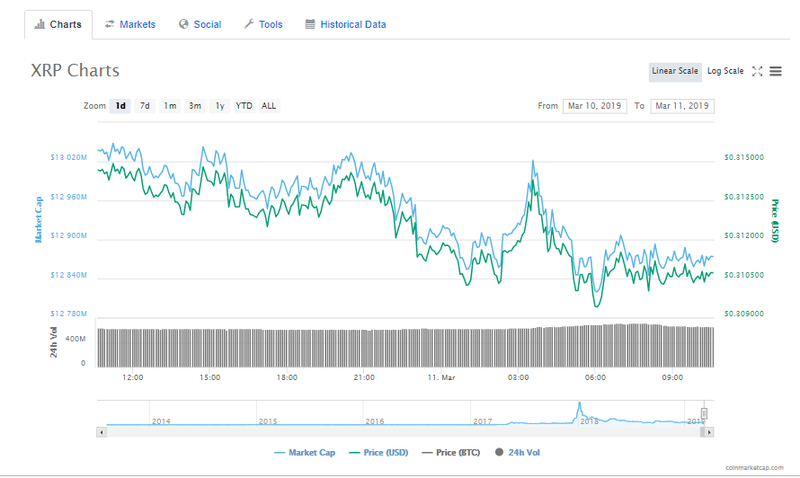 At press time, the third largest cryptocurrency is slightly down with 1.31 percent over the past 24 hours, counting the average trading volume $12,870,494,137. In specific, one XRP against US dollar is valued $0.31 as on March 11, 2019.